Die Jovis, 2 Februarii, 1642. Impeachment of Earl of Newcastle. Courts to sit at Westminster. Members in War against Parliament. Privilege of a Member in Suit. A DECLARATION for the Vindicating of the Lord Fairefax, and others, proclaimed Traitors, was this Day read; and, by Vote upon the Question, assented unto; and ordered to be sent unto the Lords, for their Concurrence. Resolved, &c. That the Earl of Newcastle shall be accused of High Treason, for actual Levying War against the King and Parliament: And that an Impeachment of High Treason be forthwith prepared against him accordingly. Ordered, That the Committee for Returns do meet this Afternoon at Two of Clock, in the Court of Wards. Ordered, That Sir Peter Wentworth do carry up to the Lords the Orders concerning the Assessing of Monies in London; and to put the Lords in mind of the Necessity of speedy Passing the Commission to the Earl of Warwick. An Ordinance to Sir Edw. Hungerford for Raising of Monies, for Maintaining of the Forces under his Command, in the County of Wiltess, was this Day read; and, by Vote upon the Question, assented unto; and ordered to be sent unto the Lords, for their Concurrence. Ordered, That the Court of Wards, the Court of the Duchy of Lancaster, and all other Courts of Westminster, do sit here at Westminster, and dispatch the Business and Affairs of the Commonwealth: And the Lords Concurrence to be desired herein. Ordered, That such Members of the House as have actually levied War, or voluntarily contributed to the Forces raised against the Parliament, shall be forthwith disabled for sitting or continuing any longer a Member of this House during this Parliament. Ordered, That such Lawyers as are Members of this House, as have repaired to Oxon, or shall repair thither while the Army is there, without the Leave of the House, shall be disabled to sit or continue Members of this House during this Parliament. Sir Peter Wentworth is appointed to acquaint the Lords with these Votes. Resolved, upon the Question, That the Four thousand Pounds, or such other Monies as are collected in the County of Lincolne upon the Bill of Four hundred thousand Pounds, and by the said Bill is appointed by the Act to be paid at Yorke (where a Popish Army now is) for the Payment of the Billet Money, shall be forthwith paid to the Lord Fairefaxe, or such as he shall appoint, for the present Supply of the Army under his Command: And the Collectors, or others, in whose Hands the said Monies are, are hereby required to pay the same accordingly. Ordered, That Mr. Trenchard do prepare an Order, to require the Collectors, in such of the several Counties as are not under the Power and Command of the King's Army, to pay the Monies, collected in the said several Counties upon the Bill of Four hundred thousand Pounds, to the Committees in those Counties. Ordered, That the Committee for the Navy shall have Power to make an Addition of Thirty Merchants Ships to the Fleet that is to be set forth this Summer. Resolved, &c. That Mr. Blinkhorne, now in the Serjeant's Custody, shall be forthwith bailed. It was Resolved, upon the Question, That the Profits belonging to the Parsonage or Benefice of the Church of Alhallowes Barkeinge, where of Dr. Lafeild is Parson, shall be forthwith sequestred into the Hands of Sequestrators; to be disposed of to Mr. Glendon, a learned Divine, and plundered Minister, till this House take further Order: Whom this House doth appoint. . . . the Place and Cure of the said Dr. Lafeild. And Mr. White is to bring in an Ordinance to this Purpose; and to set forth the Grounds of the Complaint against Dr. Lafeild in the said Ordinance. Ordered, That Mr. Roberts, Curate of the Parish of Alhallowes Barkinge, shall be removed from the Execution of that Office in that Parish any longer. Resolved, &c. That Mr. Roberts, Curate of Alhallowes Barkeinge, shall be forthwith sent for, as a Delinquent, for speaking in a scornful and deriding Manner of the Proceedings of the Parliament. Mr.Hoyle, Mr. Darly, Mr.Percivall, Mr.Browne, Mr.Millington, Mr.Bond, Mr. Young, are added to the Committee for the * * *, where Mr.Trenchard has the Chair. Resolved, &c. That Mr. Tho. Wall and the Lord Allington shall be forthwith sent for, as Delinquents, for combining with the Papists, and other Persons, ill-affected to the Parliament, and Peace of the Kingdom: And the Deputy Lieutenants of the County of Norfolke, and Mr. Toll, are to give their best Assistance for the Apprehending and Sending up of the said Persons. It is thereupon Resolved, upon the Question, That Dr. Holdsworth be forthwith sent for up, in safe Custody, at his own Charges: And that Captain Cromwell be desired to take Care to send him up accordingly. Resolved, &c. That Roger Daniell, Printer to the University of Cambridge, now in the Custody of the Serjeant, for printing the Book, intituled, "Dr.Fearne's Resolves in Cases of Conscience," be forthwith bailed. Ordered, That Captain John Alford be forth with discharged from any further Restraint: And that Sir Gilbert Gerard do acquaint him, that it was a Mistake, that he was troubled. Ordered, That a Committee shall be appointed to prepare an Ordinance for the Pressing of Seamen, Watermen, and other Artificers and Officers necessary for Sea Service; and for the Advancing of the Wages of common Seamen according to the Propositions. An Ordinance to this Effect was brought in; and, by Vote upon the Question, assented unto; and desired to be sent unto the Lords, for their Concurrence. Resolved, That this House holds Mr.Keeling to be a Disturber of the Peace of the County of Herts, an Enemy to the Proceedings of Parliament, and the Peace of the Kingdom: And that he be forthwith disarmed. Resolved, That Mr. Keeling shall be committed Prisoner to Windsor Castle, there to remain during the Pleasure of the House. Ordered, That the Deputy Lieutenants of the County of Herts, or the Committee there, be required forthwith to seize and secure the Estate of Mr. Keeling, until the House take farther Order: And Sir Thomas Dacres is appointed to send down this Order forthwith, to be put in Execution. Ordered, That the Six hundred and Fifty Pounds, payable by Sir Edmund Wright unto Sir John Wollaston, and others, the Treasurers upon the Subscriptions, be forthwith paid by the said Sir Edmund unto the Treasurers aforesaid: Who are hereby required to send the said Sum of Six hundred and Fifty Pounds unto Colonel John Ven, upon Account; towards the Payment of the Arrears due unto him for his Regiment. THE humble Petition of Fra. Goodyere, of the County of Hertforde, Esquire, was read. Resolved, upon the Question, That Mr. Fra. Goodyere shall be forthwith discharged of his Imprisonment. Ordered, That Geo. Nash and Wm. Freeman shall be added to the Six Assessors, nominated for the Parish of St. Olave's, Southwarke. Ordered, That Sir Rob. Coke, High Sheriff of Cambridgeshire, now brought up in Custody, shall be forthwith committed to the Custody of the Serjeant: And the Committee for Examinations is to examine him, and receive the Informations concerning him. Ordered, That the Order made concerning the Price of Coals shall be sent to the several Woodmongers; and be printed and published. The Order for the better Effecting the Association in the Counties of Warwick and Stafford was read; and assented unto; and ordered to be carried up to the Lords. It was Ordered, That Captain James Dockwray, sent up by that Committee, shall be forthwith discharged, and his Horses delivered unto him. Resolved, That Dr. Wilson be committed Prisoner to Lambeth House. Ordered, That Dr.Heywood do continue in safe Custody, in the Serjeant's Hands, until this House take further Order. 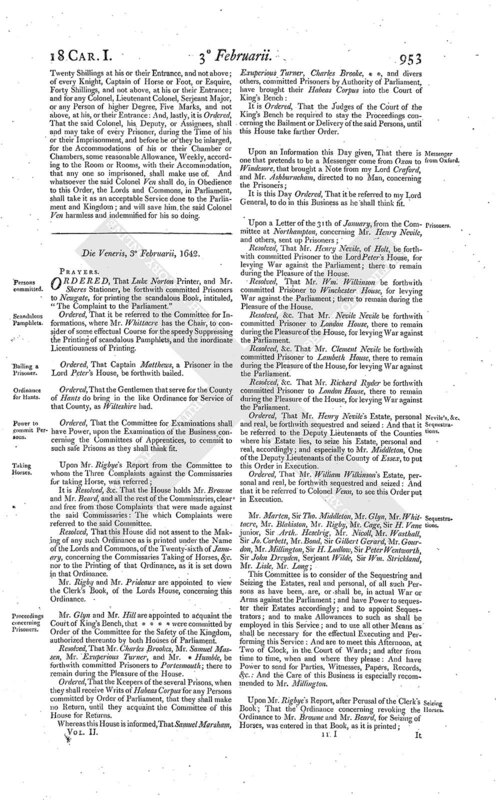 It is this Day ordered, by the Commons House of Parliament, That Mr. Emerye, Serjeant Plumber unto his Majesty, as also Sir Robert Bennett Knight, together with all other whom it doth or may concern, be hereby required forthwith to take especial Care to amend and repair the Conduit Heads of Water near unto the Castle or Town of Windsor; together with all such main and lesser Pipes, that are laid to convey the said Water unto the Castle of Windsor; to furnish his Majesty's House, the Castle: And other Dwelling houses within the same Castle: And hereof you, and every of you, are required not to fail, as you will answer your Contempt or Neglect hereof; it being for the Safety of that Castle, and for the Service of the King and Parliament. UPON Information given, That an Action of Ejectione firma is brought by one Blagrave, against one Ferney, in the King's Bench, for Lands in Middlesex; wherein Sir Thomas Cheek, a Member of this House, hath the present Interest, and is possessed by Himself and his Under Tenants; It is therefore Ordered, by the Commons House of Parliament, That Sir Thomas Cheek shall have the Benefit of his Privilege as a Member of the House: And the Proceedings at Law in the said Action are to be stayed: Whereof all Persons, that this may concern, are to take Notice at their Perils. 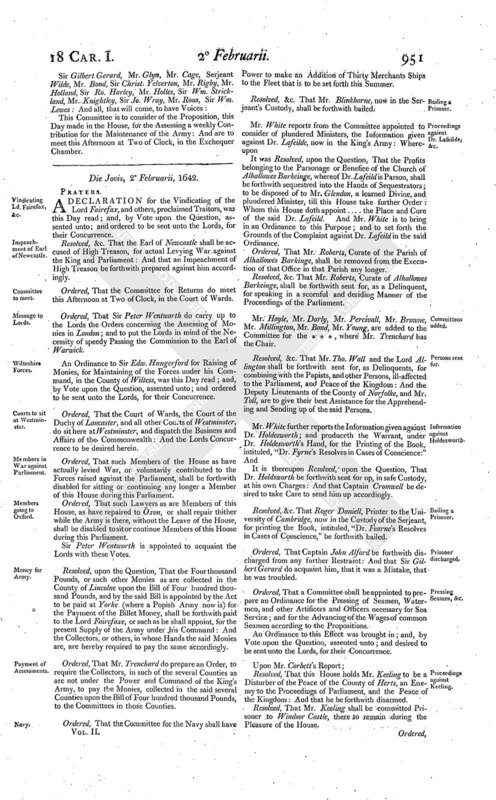 It is Ordered, and Ordained, by the Lords and Commons, in Parliament, That, for the more convenient and effectual putting in Execution a certain Declaration and Ordinance of Parliament, for the Associating of the Counties of Warwick and Stafford, and the Cities of Coventry and Leichfield, and the Counties of the said Cities, that there be added to the Committees in the said Ordinance mentioned, those whose Names are herein expressed; that is to say, For the County of Warwick, and the City and County of Coventry, Sir Wm. Bolestrod, Sir Edward Peyto and Sir Richard Skeffington Knights, Lieutenant Colonel Phippes, Serjeant Major Burgoyn Isaac Bromwich, Humphrey Mackworth, Thomas Willoughbie, Gamaliel Purefoy, and Waldine Willington, Esquires; and for the County of Stafford, and the City and County of Leichfeild, Simon Ridgley, Esquire, John Chitwood, of Okeley, Esquire, Edward Manwaring junior, Esquire, Lewis Chadwick Esquire, Wm. Jolly, Antony Rudiard, Joseph Whitehall, Wm. Bendy, Thomas Dolman, Wm. 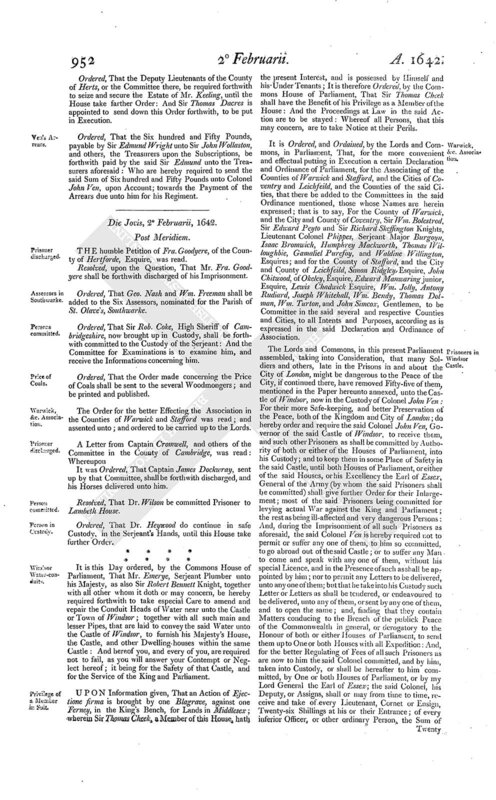 Turton, and John Simcox; Gentlemen, to be Committee in the said several and respective Counties and Cities, to all Intents and Purposes, according as is expressed in the said Declaration and Ordinance of Association. The Lords and Commons, in this present Parliament assembled, taking into Consideration, that many Soldiers and others, late in the Prisons in and about the City of London, might be dangerous to the Peace of the City, if continued there, have removed Fifty-five of them, mentioned in the Paper hereunto annexed, unto the Castle of Windsor, now in the Custody of Colonel John Ven: For their more Safe-keeping, and better Preservation of the Peace, both of the Kingdom and City of London; do hereby order and require the said Colonel John Ven, Governor of the said Castle of Windsor, to receive them, and such other Prisoners as shall be committed by Authority of both or either of the Houses of Parliament, into his Custody; and to keep them in some Place of Safety in the said Castle, until both Houses of Parliament, or either of the said Houses, or his Excellency the Earl of Essex, General of the Army (by whom the said Prisoners shall be committed) shall give further Order for their Inlargement; most of the said Prisoners being committed for levying actual War against the King and Parliament; the rest as being ill-affected and very dangerous Persons: And, during the Imprisonment of all such Prisoners as aforesaid, the said Colonel Ven is hereby required not to permit or suffer any one of them, to him so committed, to go abroad out of the said Castle; or to suffer any Man to come and speak with any one of them, without his special Licence, and in the Presence of such as shall be appointed by him; nor to permit any Letters to be delivered, unto any one of them; but that he take into his Custody such Letter or Letters as shall be tendered, or endeavoured to be delivered, unto any of them, or sent by any one of them, and to open the same; and, finding that they contain Matters conducing to the Breach of the Publick Peace of the Commonwealth in general, or derogatory to the Honour of both or either Houses of Parliament, to send them up to One or both Houses with all Expendition: And, for the better Regulating of Fees of all such Prisoners as are now to him the said Colonel committed, and by him, taken into Custody, or shall be hereafter to him committed, by One or both Houses of Parliament, or by my Lord General the Earl of Essex; the said Colonel, his Deputy, or Assigns, shall or may from time to time, receive and take of every Lieutenant, Cornet or Ensign, Twenty-six Shillings at his or their Entrance; of every inferior Officer, or other ordinary Person, the Sum of Twenty Twenty Shillings at his or their Entrance, and not above; of every Knight, Captain of Horse or Foot, or Esquire, Forty Shillings, and not above, at his or their Entrance; and for any Colonel, Lieutenant Colonel, Serjeant Major, or any Person of higher Degree, Five Marks, and not above, at his, or their Entrance: And, lastly, it is Ordered, That the said Colonel, his Deputy, or Assignees, shall and may take of every Prisoner, during the Time of his or their Imprisonment, and before he or they be inlarged, for the Accommodations of his or their Chamber or Chambers, some reasonable Allowance, Weekly, according to the Room or Rooms, with their Accommodation, that any one so imprisoned, shall make use of. And whatsoever the said Colonel Ven shall do, in Obedience to this Order, the Lords and Commons, in Parliament, shall take it as an acceptable Service done to the Parliament and Kingdom; and will save him the said Colonel Ven harmless and indemnified for his so doing.